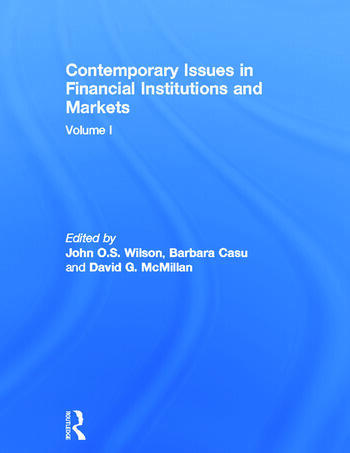 This book brings together academic work on contemporary issues in financial institutions and markets. The general theme is designed to allow for a wide range of topics, covering the diverse nature of academic enquiry in banking and finance. The contributions thus address a broad spectrum of contemporary issues including bank diversification and securitization activities; bank regulatory reforms and competition; the performance of mutual funds and alternative asset classes; role of liquidity in price discovery for credit derivatives; and the existence of the compass rose pattern within option contracts market. This book was originally published as a special issue of The European Journal of Finance. John O.S. Wilson is Professor of Banking and Finance, and Director of Research, in the School of Management at the University of St Andrews, UK. Barbara Casu is Reader in Banking, and Director of the Centre for Banking Research, at Cass Business School, City University London, UK. David G. McMillan is Professor of Finance in the Accounting and Finance Division at Stirling Management School, at the University of Stirling, UK.